LaDonna Marie Smith, 58, of Junction City, KS passed away peacefully on Tuesday, January 22, 2019 at her home in Junction City. A funeral service will be held at 11:00 a.m. on Friday, February 1, 2019, at Ward Chapel A.M.E. Church in Junction City with Reverend Andrew J. Rollins officiating and Reverend Viola W. Jones providing the eulogy. Burial will follow the service at Highland Cemetery. A visitation will be held from 6:00 – 8:00 p.m., Thursday, January 31, 2019, at the Johnson Funeral Home, 203 N. Washington Street. Memorial contributions are suggested to be given to Ward Chapel A.M.E. Church, 1711 N. Washington Street, Junction City, KS. LaDonna was born on December 28, 1960, in Junction City, KS, the daughter of Elliott & Barbara J. (Wilson) Smith. LaDonna graduated from Junction City High School with the Class of 1978. She attended Crum’s Beauty College in Manhattan, Kansas. She was a member of Ward Chapel A.M.E. Church and was a proud and courageous Breast Cancer Survivor. She enjoyed cooking and talking. She was known by her family as “LNN, LaDonna News Network”. She had a giving heart, an infectious laugh, and the most beautiful smile. She never met a stranger. She was a sister, mom, and aunt to many. She always had a kind and encouraging word. She was full of life and enjoyed caring for the elderly and sick, which was her purpose in life. On the day she passed, she was trying to help a neighbor who was ill.
She was the proud parent of three children and loving NaNa to six grandchildren. Her memory will live on in all the lives she touched. Her smile and giving spirit will continue to shine through her children and grandchildren. LaDonna leaves to mourn her most prized possession, her family. Survivors include: one son, Lynn “L” Smith and his wife Amber of Topeka, KS; two daughters, Rina D. Neal and her husband Jimmy of Junction City, KS and Teena M. Figueroa and her husband Raymond of Lawton, OK; parents, Elliott and Barbara J. Smith of Junction City, KS; one sister, Sylvia L. Brown of Junction City, KS; and two brothers, Elliott Lynn Smith and Erick Lamont Smith of Junction City, KS; six grandchildren: A’Lya E. Figueroa, Ariana Smith, Jayson L. Neal, Adric Smith, Maya D. Neal, and Lailani Smith; two aunts: Suzanne Cole and Shirley Wise; three nephews: Byron J. Brown, Elliott “Buster” Smith, and Eric McMahan; one niece: DeAnne McMahan; many great nieces and nephews; and a host of family and friends who loved and adored her. LaDonna was preceded in death by her grandparents Will and Katie Smith and David and Mary Wilson; as well as several aunts, uncles, and cousins. Add your memories to the guest book of LaDonna Smith. Ladonna Smith McCoy was my true friend in life and I will never forget her. We always laughed together and shared wisdom amongst one another in both sad and happy times. I am glad to have known her. Thank you Mr. and Mrs. Smith for bringing her in this life to share her joy and happiness with all of us. I will truly miss her. I will miss her smile; for it brought about a smile on face every time I saw her. I will miss her laughter; for it made me laugh when we always joked with each other. Most of all I will miss her kindness of words as well as wisdom; for she always had something loving and intelligent to share with me whenever we crossed paths. Ladonna Smith McCoy I love you and will never forget you. Thank you Mr. and Mrs. Smith. My prayers go out to all of you. I'm sorry for your loss, and do understand the loss of a Mom, a sister and a friend. The loss will feel different to everyone that loved her. Please pray and think of the many memories. I will miss you. May God hold and keep you. I loved her more than you will ever know. We were sisters. It was an unconditional love. I met her when we were in 7th grade. She accepted me as her friend and always told me that no one would ever mess with me . I believed her. As long as I was her friend, I became everyone’s friend. Ladonna had a strong presence wherever she was and everyone loved her. I don’t know how to go one without her, but I know she is my guardian angel. I will miss her weekly text messages, our long conversations over the phone. Until we meet again my dearest friend. I love you and your family with everything I have. I always waited to hear "Have a blessed day" when she would call for Rina. That always made my day brighter. Rina, Lynn and Teena - please accept my condolences for the passing of your mother. Your mother was a perfect model and example of what a giving, loving parent can do for their children. I’m proud of you guys! I pray for the Peace and Comfort to her family and to all that knew her. Ms. LaDonna was very kind and always up for a chat. Her legacy lives on through her dearest ones and those she touched. On behalf of RRAD CPAC, our thoughts and prayers are with you Teena and your family. We are sorry for your lost and will keep you in our prayers. I will miss seeing Ladonna when we come home to visit. She was truly one of the friendliest people that I know. She would always greet me and my family with a smile and a big hug. She is with the Lord now, but we will miss her.We are praying for you family and know that God is here to comfort you all. We are so sorry for your loss. We loved LaDonna and she will truly be missed. I enjoyed baking sweet potato pies for her during the holidays for the last few years. Our prayers is that God continue to bless each of you and comfort you during this time. I am grateful, yet sad, that I did not get to see LaDonna before her passing. The last time I engaged with her was at the Foster Cuts Back to School Bash where she volunteered to help us with the event. She called me to thank me for her Certificate of Thank You for volunteering for the event. It really touched her. I am glad she did have some good memories during this last week of posting my family pictures and memories of Tami on Facebook. She liked most of them and remembered our cousins coming from California to JC in the summers of our childhood. I am glad that she was able to have some good memories of the summers with my family. I am sure it brought her joy just like it has done for me and so many others. We always discussed fashion (and shoes) and I would love to see her going to or coming from church as I knew she was going to be dressed to the 9! Rest well, my beautiful friend...I will surely miss you. All is well. You Are Complete. And so it is. Miss LaDonna was always smiling when I saw her. She was a sweet woman. May God bless you family. To the Smith family my prayers go out to your family and I'm deeply sorry for your loss because you lost a beautiful angel with a beautiful soul. I will keep you in my prayers and God bless you all. May God comfort you through this difficult time much love!! LaDonna we have some good time in high school and also when you came to my parents house when we did the JC 4 life reunion and how we sat there talking about my mom and I used to come up to the house and visitor and how you adored her now you up there with my mom laughing and talking about the good old times. I'm going to miss you rest in peace Ladonna you're truly going to be missed with your beautiful smile and your beautiful soul... love you!!!! My condolences to the family, LaDonna was a good friend of mine, i enjoyed her company, that smile she had just light up the room when she enter it, she will truly be missed. I will always love her. Some of my fondest memories of LaDonna was when she was a cook at the Main Post dining faciltiy on Fort Riley. She would always greet you with a smile and an encouraging word from the Lord! When you became a regular she knew automatically what you wanted. I never saw her in a bad mood, or angry. It truly was a blessing to have her fix my omelets each morning that I went to the dining facility. Each time I saw her always had a smile and bubbly personality. The last time I saw her she was walking across 8th street. We hugged, laughed and encouraged one another and went on our way. Praying that the Joy of the Lord continue to be your strength during a time such as this. To the Smith family you have our co mdolecees My prayers is that God continue to bless each of you and comfort you at this time. Condolences to the Smith family. Ladonna May your soul Rest In Peace. I remember growing up in JC, that infectious laugh. Going to the Saturday bottle top movies, drive-in movies, skating, 5th street park and so many memories. Your beautiful children will make any parent proud. Your sweet mother and sister my heart goes out to you. I pray the Smith family will find comfort in the Lord. When the Lord prepares a place for us, he calls us home. Remembering the other day when I saw you in Dillon's and asked you about la donna, you reply was she was doing good, now I read about her obituary.. she will be missed,, will be thinking about you and the family during this difficult time..
their time of sorrow. Herbert. Dorothy, Latasha and Corey Shook. I will miss your beautiful smile and laugh. Thank you for welcoming me into your family. My heartfelt condolences go out to you and your family. You all are in my heart and prayers. I still can't believe I'll never see LaDonna around town again. She and I always ran into each other, knowing each meeting was a Divine Connection. The last time I saw her she said, "I've been looking for you.". As always, she was laughing, sparkling with joy and beauty. I will never forget her hugs, laughter and courage. We never left each other's company without prayer. 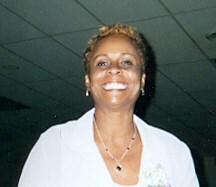 LaDonna was that free, loving spirit who inspired all of us to always meet life head on with joy, peace and gratitude. She was, and is, one of Junction City's rare, unforgettable legacies. I'll miss her. And I'll never forget her. Ever. We send our deepest heart felt condolences to your family. My mother Margaret Stewart-Sims considered her as her third daughter. Where she has joined my mother in heaven. After receiving her Angel wings in heaven. LaDonna will never be forgotten. Her gestures of a smile and laughter that was worth a million dollars. Always courteous and will always be a part of our family. God bless her soul. She's in God's hands. We send our condolences to the Smith family, who was our friend for over thirty year, God saw her road was getting rough, her hill was hard to climb, He gently closed her loving eyes,, and whispered, peace be thine, her weary hours and days of pain, her weary nights have passed. her ever-patient worn-out frame, have found sweet rest at last. my GOD bless the Smith family. To Teena Figueroa and family, the Akpiri family is so sorry for your loss and send heartfelt condolences. We pray that compassionate, kind words, hugs from others, and sweet memories of your mom will comfort you during this difficult period. We pray for God's continued strength and peace in the coming months, AMEN!!! Will miss her dearly especially her commenting on my Facebook posts. Love you LaDonna rest well in heaven! I remember the summer me, Ladonna and Theresa all worked that summer at the kiddie pool on 5th street. We had so much fun that summer. We always laughed when we talked abt our adventure. She will be missed by many and never forgotten. You all are in my prayers. Soar high with the Angels and keep on smiling Ladonna. Much love to you all from the Saunders family. Dear Sweet Ladonna; we love you! ! Beautiful lady inside and out. She'll be missed. Thank you for always having a hug and a smile for me. My greatest sympathy for the family. To the family of my dear friend Ladonna my heart is saddened at the loss of of my very dear friend I will miss her beautiful smile and funny jokes the talks we used to have and the time we spent together. The people that was lucky enough to be in her presence she left a lasting impression on them. I really loved your mother she was my best friend I sit back lately and think and laugh about the times we shared. We laughed we cried we had ups and downs but always was there for each other. Keep your head up when you think of her smile she's in a better place even though she was gone too soon no more suffering no more pain knowing her as I do she is smiling down on us comforting us in her arms saying I'm okay Darling. You all are in my thoughts and prayers. I am wishing you peace and comfort in this time. My heart goes out to you and your family. Dear Teena and Family ~ My deepest, heartfelt sympathy for your loss. I pray that you are comforted during this sad time and shared memories will bring you through. You are in my thoughts and prayers. I just wanted to let you know that you and your family are in my thoughts prays. Thanks for all the great memories. Seems like yesterday we were just little kids running around and playing. I miss you already, but know we will see each other again. I will always remember you as my “lil” cousin.